Welcome to the home of the Conifer Historical Society! Formerly known as the Conifer Junction Schoolhouse, our beloved 1923 one room schoolhouse is now known as the Little White Schoolhouse and was placed on the National Register of Historic Places in 2014. This wonderful example of a rural one-room schoolhouse was deeded to the Conifer Historical Society in 2012. Since acquiring this historic structure, CHSM has invested thousands of volunteer hours and significant sums of money towards maintenance and historic preservation. The Schoolhouse is open for tours by appointment. Click Here to View our information on the National Register of Historic Places. The Conifer Junction Schoolhouse was built in 1923 to replace the previous schoolhouse, which was in an abandoned reform Mormon Church. Conifer School District, District No. 9 decided a new school was necessary and approved the funds in 1922. John J. Mullen, nephew of well-known philanthropist, in Denver, J.K. Mullen, loaned the land. 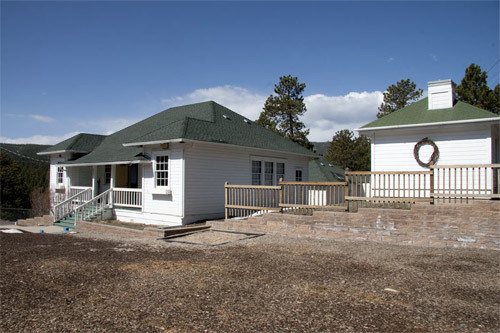 Conifer Junction Schoolhouse was the first purpose built school in Conifer. The school functioned as a one-room schoolhouse until after consolidation when Jefferson County decided to build a larger schoolhouse due to the population growth was necessary. A barn was built in the 1930s to house the animals that the teacher and students rode to school, including the horse that the teacher would previously bring into the basement while she was teaching upstairs. West Jefferson Elementary opened in 1955, north of the Conifer Junction Schoolhouse. The school district found the new school to not be large enough shortly after opening due to population growth so Conifer Junction became an overflow classroom. In 1965 the Jefferson County School District converted the Conifer Junction Schoolhouse to a preschool. It operated as a preschool until 2012.